If you don't know mid-Suffolk, you may well be surprised by the hills which roll across the space between Stowmarket and Hadleigh, as if this was not East Anglia at all. In this remotest part of the county, miles from the nearest town, villages take on a self-sufficient air, and Hitcham is the largest of them. 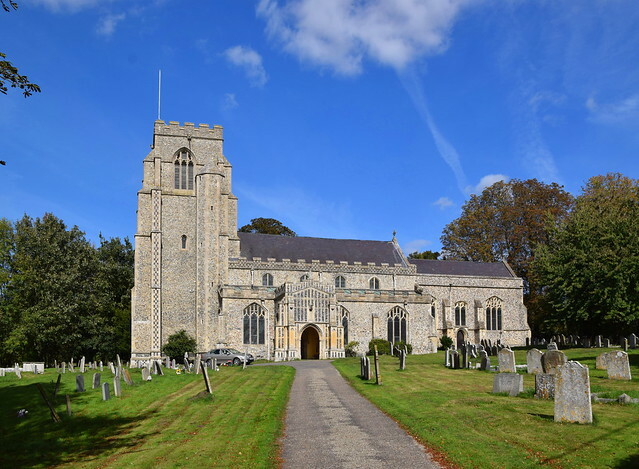 Its church, All Saints, sits high in a wide open churchyard on the outskirts of the village. The house opposite the entrance to the graveyard was the medieval guild hall. This is a big church, and was once the centre of one of the county's largest parishes. It was the Priory of Ely's most valuable living in the whole of the county, worth twice as much as any other, and was therefore bestowed on favoured clerics. This situation continued when the patronage was taken over by the state after the Reformation, and to be made rector of Hitcham remained a desirable appointment well into the 20th Century. As the excellent guidebook notes, some rectors of this parish achieved fame and influence. Take Adam Easton, for instance. In the 14th Century, he was made a cardinal while still rector here. However, as he was also Archdeacon of Shetland, Orkney and Dorset, as well as Prior of Saint Agnes at Ferrara in Italy and the personal secretary to Pope Urban VI, one assumes that he didn't spend a lot of his time on parish business. His successor John Bremore was the personal secretary to the antipope John XXIII at Avignon, so presumably he didn't live in the parish either. John Whytewell, Rector throughout the Reformation, was chaplain to Thomas Cranmer, although, unlike that stubborn character, he received a royal pardon from Mary. Coming forward to the 17th Century, Laurence Bretton was a solid Laudian, ensuring his inevitable removal by the Puritans as a scandalous minister (for which, read 'liberal intellectual'). 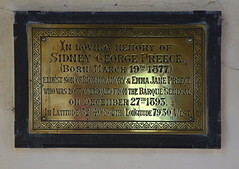 His successor, Miles Burket, had also been a Laudian, but in a Vicar of Bray fashion he became the Puritan preacher here, and died in poverty after the Restoration. Mostly, the Rectors here seem to have been a jolly lot. John Matters, in the first decades of the 19th century, was famous for his befriending of, and care for, the poor of the parish, matched only by his neglect of his ecclesiastical duty. He is quoted in the guide as having a favourite saying: He that drinks strong beer, and goes to bed quite mellow, lives as he ought, and dies a hearty fellow. And his successor was Hitcham's most famous rector of all, but we'll come back to him in a minute. 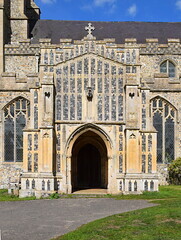 Hitcham was not home to a great landed family, so it was the power and wealth of Ely priory that built this church. It is a grand affair, entirely rebuilt in the 14th and 15th centuries. One look tells you that this was not a piecemeal building. Mortlock observes that the grand flushwork porch is very like the one at neighbouring Bildeston, but it does not seem so imposing here against this big building. 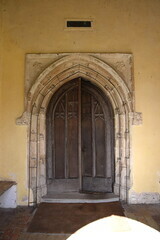 There is a very odd stop on the 15th century doorway. The one on the left is a lion, but on the right there appears to be a wild man and a tree surrounded by a picket fence. At first sight, the interior is slightly disappointing. Large and plain, it is as if it had been scraped clean by Miles Burket's cronies, perhaps in reaction to the incumbency of Laurence Bretton. The brick floors are attractive, and the fine 14th century aches of the arcades reach right up into the clerestory, but the heavy Victorian woodwork gives it all a sombre feel. 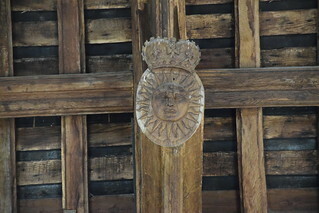 The hammerbeam roof was rebuilt after the Reformation, and includes lots of unfamiliar secular imagery, the heraldry of the State. However, there is some dispute about exactly when this happened, why, and how much was renewed. The arms of both James I and Charles I are here, giving a date in the first third of the 17th century, but the pineapple pendants appear more recent. 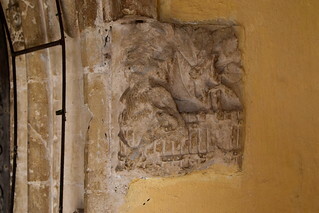 At the west end, however, there are a couple of secretive green men on the hammer beam ends, which must be from an earlier age. 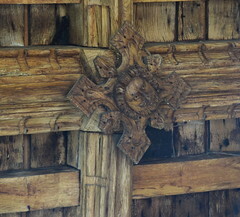 One theory suggests that the roof was repaired in a hurry after a fire, and then beautified later. The chancel is a 19th century rebuilding (a photograph of this event, which used to be at the west end, is rather alarming, like a gap-toothed Madonna) and it is evidence of the Anglo-catholic enthusiasm of Alexander Grant, Rector for the last 40 years of the 19th Century. At nearby Kettlebaston, this enthusiasm was realised by the Vicar there in the form of a gorgeous little shrine, but here, something more grandiloquent was intended. 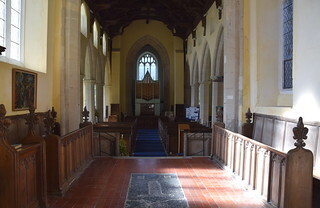 Hence the five steps up to the chancel, and two more up to the sanctuary, representative of the seven sacraments of the Catholic Church, and familiar from 19th century London Anglo-catholic churches. There is no evidence that Anglo-catholicism ever took such a firm foothold here, though. 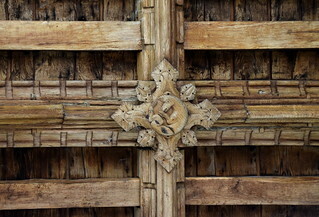 The chancel is so grand, some visitors must easily overlook the remains of the rood screen. 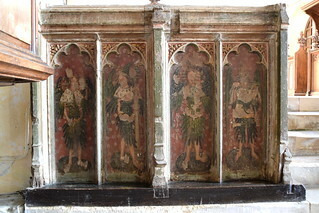 Only the dado survives, but it is worth a look because instead of saints the panels depict angels holding the instruments of the Passion. 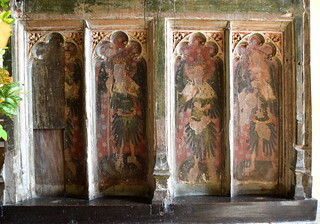 Something similar can be seen at Blundeston in the north of the county, and there are also angels on the screen at Southwold of course. Not surprisingly, they were vandalised by the 16th century reformers. What is more surprising is that they have survived at all. Presumably they were moved to their present position at the time of the 19th century reordering, but when Arthur Mee came here in the 1930s, he could barely discern them as figures, and thought them saints. So they've been restored, probably under the influence of Munro Cautley when he was diocesan architect. In such a wealthy parish, perhaps it is not surprising that little else medieval survives. The converse of this, of course, that the restoration of this church has generally provided work of quality. Although the benches are heavy, they do carry several bench ends which are probably the work of the great Ipswich woodcarver Henry Ringham. The best are the four evangelistic symbols towards the front. 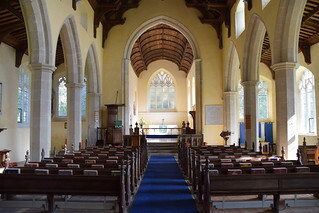 In fact, the guidebook suggests that the benches were removed from the church towards the end of the 19th century and replaced with chairs as at Rattlesden and Kettlebaston, only to be returned at the behest of the eccentric and splendidly-named Maxwell Maxwell-Gumbleton, who was jointly Bishop of Dunwich and Rector of Hitcham in the 1930s and 1940s. 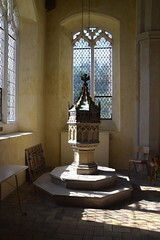 Maxwell-Gumbleton had a Bishop's throne built, which he installed in the chancel. It must have given his parishioners something to think about. 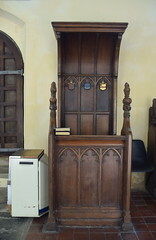 It is still there today, and is replicated in slightly more modest form by the churchwardens' seats at the west end. 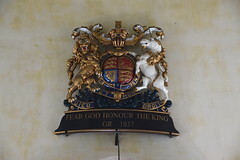 Maxwell-Gumbleton's also are the George VI coat of arms, dated 1937, and a lovely modern font cover, given as a memorial. From an earlier age are the very elaborate brass inlay in front of the sanctuary, and the mid-17th century memorial to a Waldegrave in the north aisle, more austere than it would have been twenty years before or after. In the south aisle there is a copy of the Adoration of the Magi by Rubens, which is in Kings College Chapel. At first, I couldn't work out why it looks a little odd, and then it hit me - it is in reverse. Many years ago, I chatted with a churchwarden here, and she told me tha, although 42 men in this parish lost their lives in the first world war, only 28 of them are remembered on the war memorial here. 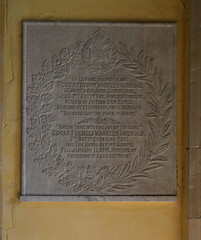 She suggested that this was perhaps because the others were from chapel families, or perhaps the families had moved away before the memorial was installed. Whatever, it gave me pause for thought, for if a similar situation exists in other parishes, then we may assume that many hundreds of people who gave their lives have, in fact, been forgotten. But one name stands out in this parish as forever being associated with it. 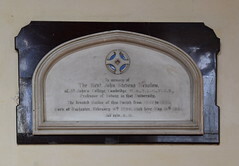 You might overlook the simple memorial in the chancel by Thomas Woolner, and you'll certainly miss the little memorial plaque above the door as you came in, but both are worth a look because they both remember the same person, the great John Stevens Henslow. Henslow was a remarkable man by anyone's standards. He was Regius Professor of Botany at Cambridge University in the 1830s, and was looked on with enough favour to secure the lucrative Hitcham rectorship. 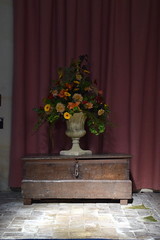 However, rather than send a poorly-paid curate to do his work for him, which would have been the usual early 19th century Trollopeian way, he followed in John Manner's footsteps, and came to Hitcham himself. It is hard now to imagine what a contrast this remote place must have been with cosmopolitan Cambridge, barely 40 miles away. Henslow wrote in his diary that he had come to "a woefully neglected parish, where the inhabitants, with regard to food and clothing and the means of observing the decencies of life, were far below the average scale of the peasant class in England." It is recorded that his first congregation here in this vast space was insufficient to fill one pew. Over the course of the next 25 years, he turned his parish upside down, applying his scientific knowledge to the antiquated and conservative farming methods of the local farmers. He increased their prosperity, and that of the poor farm labourers. He started a school, and an institute of adult education. He led outings through the local countryside, and would sometimes take the whole parish on the train to London, including one trip to the great Exhibition of 1851 in Hyde Park. It was said that the entire village emptied on these occasions, travelling by cart and on foot to Stowmarket railway station, and then on to London. "Everyone is to be in good humour", he told his parishioners, "accommodating to all, and especially attentive to the ladies of the party. If the weather should prove unpropitious, every one is to make the best of it, and not to complain more than he can possibly help." It is said that, on holiday at Felixstowe, he realised the fertilizing properties of the coprolite nodules in the cliffs there, and interested two local farming brothers so much that they set up a fertiliser processing factory at Ipswich docks. Their name was Fison. But an even more famous name associated with Henslow is Charles Darwin, one of Henslow's students at Cambridge. Henslow encouraged Darwin to investigate the development of species, finding him a place aboard HMS Beagle, the scientific survey ship. Darwin sent his notes and samples back to Henslow, who circulated them in the scientific community. Darwin came back to England to find himself a celebrity. The basis of The Origin of Species was put together at Hitcham Rectory, although Henslow would later repudiate its conclusions. Most importantly, however, as far as my children were concerned when they were younger, Henslow was the guiding light behind the opening of Ipswich Museum, which still retains one of the finest 19th century natural history collections in the country. A portrait of him hangs in the entrance hall, and the name of a road in the east of the town remembers him. He died at the relatively young age of 65. His predecessor had been the jolly John Matters. 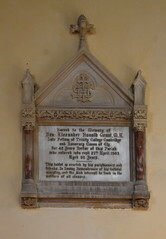 His successor was the Anglo-catholic enthusiast Alexander Grant, who, as well as rebuilding the chancel, is still remembered in the village for taking the side of the workers during the lock-out strike of 1874, when he allowed them to use the church building for their meetings. These three extraordinary men between them spanned the entire 19th century here. Trollope himself could not have written a better novel.